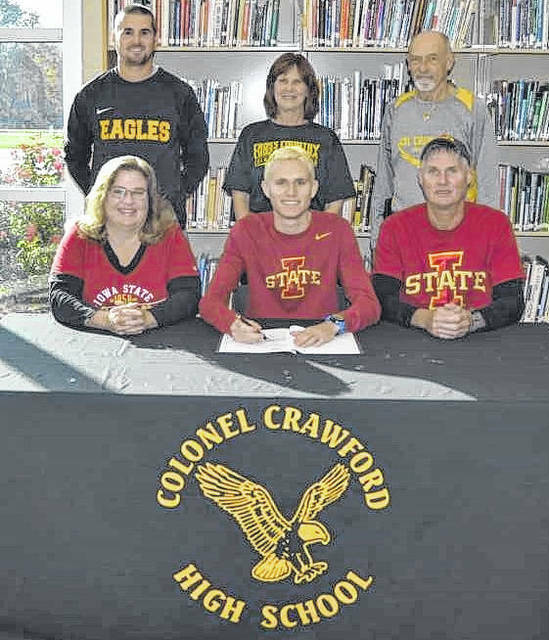 NORTH ROBINSON — Last week, Colonel Crawford distance runner Chad Johnson officially signed his letter of intent to attend school and run cross country and track at Iowa State University in Ames, Iowa. Johnson will be headed west to join friend and another skilled distance runner, Andrew Jordan, a 2015 graduate of Watkins Memorial and also an OHSAA State Cross Country champion. Johnson signs with the Cyclones just four days after completing his 2017 cross country campaign with his second consecutive state title. Now that Chad has chosen where he will spend the next four years after graduation, it’s time for running, running and more running. The winter indoor track season awaits to prepare Chad for his senior spring track season in which he will look to repeat as state champion in the 3200-meter run. Congratulations Chad and best of luck at Iowa State in 2018 and beyond!